I enjoy singing, but in preparing for this, my first solo recital, I may be trying to be too professional. Therefore, I am fussing and spending too much time memorizing words. So there goes practicing in the Musical Sewing Room. I try to work on memorization and as I get distracted lining up the next seam, it degenerates to la-la-la. Um, yes, I made that dress. Last year when I took up fencing I made myself a fencing equipment bag, just because I could. As a true designer might expect, contemplating the design took longer than making the bag. Not wanting to go through this again, I thought I would never make another one. But as it turned out, I really wanted to contribute something original to our fencing salle's fundraising event, so I donated a "custom-made fencing bag". Before I made this one, I wrote down instructions for myself with the intention of making it available online for free eventually. 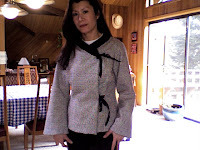 Burdastyle.com is inspiring me to create my own patterns and share them. They even have the instructions for creating a .pdf file for patterns and upl oading them. The person who "won" this bag at auction really likes red. And I had the cool silver skull brocade fabric which I snatched up on ebay--I knew somebody would like it! Just got the 4 assortments I ordered from Fabric Mart today. What a deal! Corduroy assortment, blouse weight assortment, semi-sheer dress weight crepes assortment, and dark-colored stripe and plaid suiting assortment, a total of 48 yards for $60. But since I ordered it when there was a sale on the website, I got it for even less--the equivalent of free shipping, so about $1 a yard! I like ordering the assortments because it allows me to try different fabrics that I might not have chosen, stretching my design imagination. Outrageous colors get relegated to Halloween costumes. Check out the huge heavy box--so much fabric! What drew me to this Onion pattern was the simplicity of the design. Ties instead of buttons. No pockets. Band collar rather than notched. This became the chosen pattern for the silk tweed in my stash. I once had a cream wool jacket(from the 80's!) with wide black banding at the edges which was really me. So, keeping that in mind, I deduced that black details would make this jacket successful. I am surprised at how good it looks in the photo. One small problem is that--maybe you knew it--this jacket cannot be worn open! So it's a good thing I made it from breathable silk, and silk lining which feels like a dream. Another small problem with it is that the wide overlap in front creates quite some bulk right there. I suppose I could get used to it. But if the jacket is always worn closed, why put up with the overlap? Maybe the underlap side should be cut a few inches narrower on the inside, or angled a bit. I added an extra pair of back darts. I am beginning to realize this is a consistent alteration. One other thing, this jacket sure reminds me of a karate ghee! 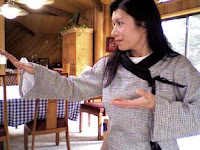 Why make gloves?What attracted me was that gloves take hardly any fabric. No interfacing, and seemingly little time. It's just another thing I wanted to be able to make. Vogue V8311 offers 9 different variations on the woman's glove. I chose view A, without sewing on the jeweled embellishments. The blue velvet needs no embellishment, don't you agree? In fact, I was surprised at how elegant these make my hands look, elongating my fingers and slenderizing my wrists... My amateur photography just doesn't show any of this. I was expecting to be doing a bit of hair-pulling, but maybe because of my choice of fabric, this project was actually fairly easy. The stretch blue-velvet panne hides any sewing imperfections, and does not unravel at all.